The results are in. See who was voted best. 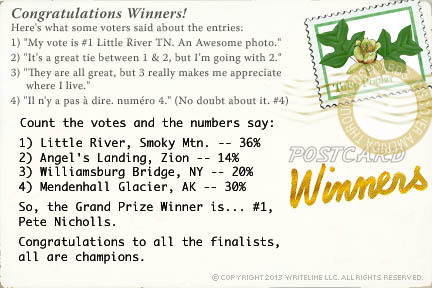 1) "My vote is #1 Little River Tennessee. An Awesome photo." 2) "It's a great tie between 1 & 2, but I'm going with 2." 3) "They are all great, but 3 really makes me appreciate where I live." So, the Grand Prize Winner is... #1, Pete Nicholls. Congratulations to all the finalists, all are champions. Thanks to all the contestants for submitting such great entries and congratulations to the four finalists who will receive an autographed copy of our book, Discover America Diaries. 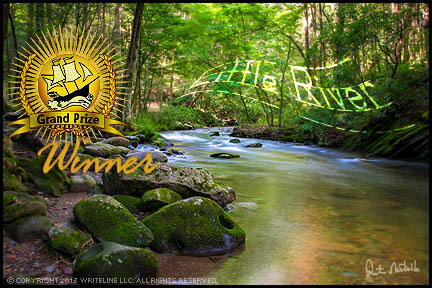 The grand prize winner will receive the book plus $100.